Standard vs custom made soft contact lens fit: place your bets! The main driver being the fact that ongoing advancements in contact lens materials and advanced optics have not succeeded at reducing the number of dropouts. Arguably, we may wonder whether the commoditisation of the contact lens category has played a role in this subject by oversimplifying lens fitting and somewhat negatively impacting our standards of care in clinical practice. In the present review, we will highlight some of the patient-, lens- and practitioner-related factors that should be considered in order to improve lens fits and on-eye performance, as well as patient satisfaction rates in the long-term. Research by Rumpakis and colleagues (2010) showed that reduced comfort, especially related to dryness; decreased or unstable vision; and compromised eye health were common findings in lapsed contact lens wearers3. Their 30% drop-out rate estimation is still assumed to be valid at present in Europe, which to certain extent could explain why the category has remained relatively flat for several years. A survey involving over 16 thousand subjects highlights that 33% of wearers drop out within a period of 3 months after the initial fit, while one in 10 simply give up at the initial 2-week trial period4. This lays emphasis on the role of the eye care practitioner in identifying and preventing early signs of a sub-optimal contact lens experience. Dropouts carry economic implications in terms of revenue, loyalty and practice building3. Therefore, we shall aim at getting better understanding of the different components involved in a perfect contact lens fit. Managing a successful contact lens practice requires a careful, individual assessment and understanding of the “human factor”. From your initial consultation to the final lens fit: everything should revolve around the patient. Current practice standardisation, however, tends to disregard patients’ individuality. Epidemiological studies show a significant variability for biometric data in healthy eyes, primarily corneal size and shape. Similarly, ocular surface physiology also affects contact lens comfort in a unique way, particularly as it relates to tear film composition and stability, eyelid muscle tone, blink dynamics and eyelid wiper integrity. Finally, optical factors such as ocular aberrations, pupil size variations and the accommodative response can also vary considerably among the optometric population. With all these variables in mind, it should be appreciated that there is probably no one single factor that would guarantee a successful contact lens wear for every patient. Following a systematic approach may be the best strategy (Figure 1). In designing your strategy, it is important to reemphasize that a thorough patient history should always be your starting point. Underlying systemic or ocular diseases or medication intake/topical application may compromise contact lens comfort. Patient’s occupation, lifestyle and the environment in which the lenses will be worn as well as their motivation and expectations are critical to assist you in contact lens recommendation. Ultimately, patients’ subjectivity will be integral to contact lens success and that’s why you should ensure goodquality discussions and interactions are taking place with your patients at all times. When it comes to contact lens selection, you may start by looking for the best match between patient needs and the standard lenses that are readily available to you. Lens modality (daily vs frequent replacement) and contact lens material (silicone hydrogels vs modern hydrogels) will usually be the key filters when narrowing down your selection. Regarding lens materials, it is now acknowledged that silicone hydrogels are not the holy grail of contact lens-related comfort5. Some patients will be best suited for silicone hydrogel contact lenses. 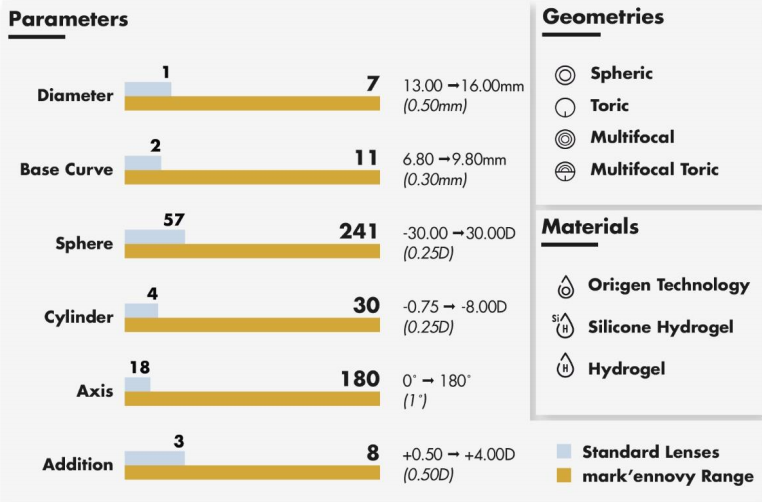 But, for those who do not experience the benefits of a lens with silicone, polymer engineering has now overcome some of the flaws of conventional hydrogels by introducing the latest generation of biomimetic hydrogels5. Ori:gen technology applied to the award-winning Gentle lenses by mark’ennovy feature a homogenous cross-linking agent to produce a unique, extra-porous matrix whilst ensuring that the lenses undergo less than 1% dehydration. Their extremely low coefficient of friction (CoF 0.05), which mimics the lubricity of the cornea itself, also accounts for lens wettability and a natural wearing comfort. As a clinical tip, bear in mind that a suite of contact lens materials should be available in your clinical toolkit for you to choose based on patient’s physiology and needs. Recently, I had an interesting patient: myself. As an early presbyope, monovision did it for me up until recently. Then my vision started to bother me. Especially at conferences, in the back of the room in dim light conditions – the screen just wasn’t sharp enough anymore.And with prolonged reading, I noticed that I was closing one eye (the distance eye, obviously). Not very comfortable. In the search for a good alternative, I learned a lesson or two.